We ended up not being able to launch the boat because it was still too early. 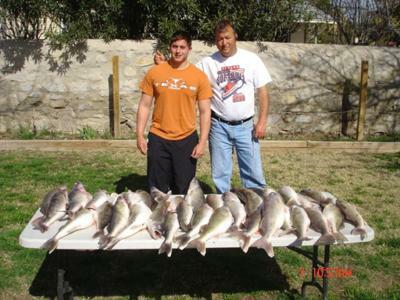 So my father and I decided to cast along a river system that fed out of Elephant Butte. We knew 5 a.m. was a little early for the winter but we had been itching to use our new poles. We then found a spot on the river system where it curved and threw out our first cast. Two reels and one stop later, both of our lines twitched and we pulled back in unison. We thought we snagged one another until both of our lines began to peel away... A double!! As we fought the fish with our 6 lb line, we noticed the closer they got what they were... walleye attached to those chartreuse 2 inch grubs with a 1/4 ounce green jig with red eyes! Zzzzzzzz again!! Another double and another 10 lbs (2 five pounders) to add to the dinner. 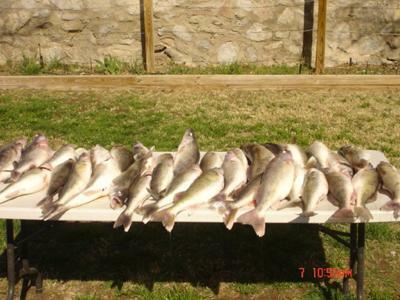 We limited out within 20 minutes with 5 walleye a piece. We then called some of our buddies who we were gonna meet and told them what happened. Needless to say, they were there in 5 minutes. 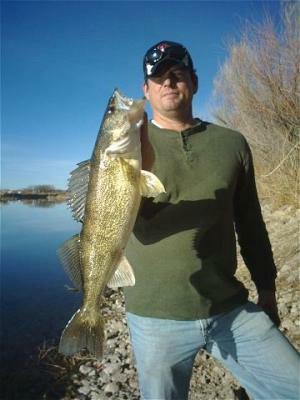 Within 2 hours, the three of them limited out on 4-6 pound walleyes. It was amazing! We spent the rest of that day catching and letting go everything. We were greedy and was still hoping for that record. That record never did come but then again that was a record day itself. 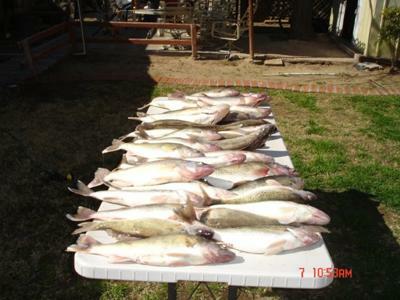 We then went home, cut up those meany-greenies and had one great fish fry. A truely enchanted day.